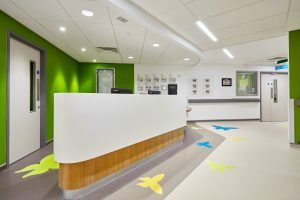 Janet Lowe from Forbo Flooring Systems discusses the role of flooring within healthcare establishments and looks specifically at a recent project completed by the IBI Group. Over the last few years, hospital interior design has risen up the agenda following various studies highlighting how patient surroundings can have a major impact on rates of recovery, as well as affect those working within the building. As such, there is an increasing move away from cold, sterile and institutional designs towards replicating a therapeutic and even homely environment, to promote quicker recovery times and more calming spaces. This new approach to the design of healthcare establishments is being achieved through the specification of furniture, paintwork and an understanding of the important role that flooring plays in this design transition. Although floors are only one element of creating a healthier and more comfortable environment, they play an important role in design, offering multiple benefits — from reducing the impact of sound, contributing to improved air quality and the creation of hygienic environments. So when it comes to choosing a floor covering, characteristics such as colour and design, Light Reflectance Values (LRV) and cleanability should be considered. There are floor coverings available that help in this regard, such as Forbo’s new homogeneous vinyl collection, Sphera. The Sphera Element range offers a balanced palette of 62 colours, providing a wide choice for healthcare design and offering the opportunity to select colours that work to create the desired ambiance. In addition, almost half of the colours within the range have Light Reflectance Values (LRVs) higher than 40%, in order to maximise any form of lighting within a building, whether natural or artificial. The IBI Group discovered the many design benefits of homogeneous vinyl when it was tasked with designing Glan Clwyd Hospital’s Mother and Baby Unit. Cristina Tegolo, Designer at IBI Group, who designed the ward, says: “The unit is for mothers and their babies that are born sick or premature, from 27 weeks to Term and therefore in need of hospital care. Because of this, we needed to create a sense of calm and warmth. We created a butterfly flooring design to complement the wall art, which is a forest-like scene of trees, and the hospital really loved it. These colours were chosen for the butterfly pattern due to their serene connotations, flowing throughout the corridors and into the equipment rooms, acting as an aesthetically pleasing wayfinding tool. The range also benefits from SMART (Sustainable Modern Advanced Robust Technology) technology, with the SMART-top finish ensuring the flooring has a high resistance to chemicals, scratches and stains. While the in-line coating and subsequent embossing process results in superior appearance and durability, which sees the new Sphera range achieving the highest abrasion wear rating group T. It also has very low emissions of <10ug/m2 after 28 days and is 100% phthalate-free, which helps to ensure that it contributes to a healthier indoor environment. 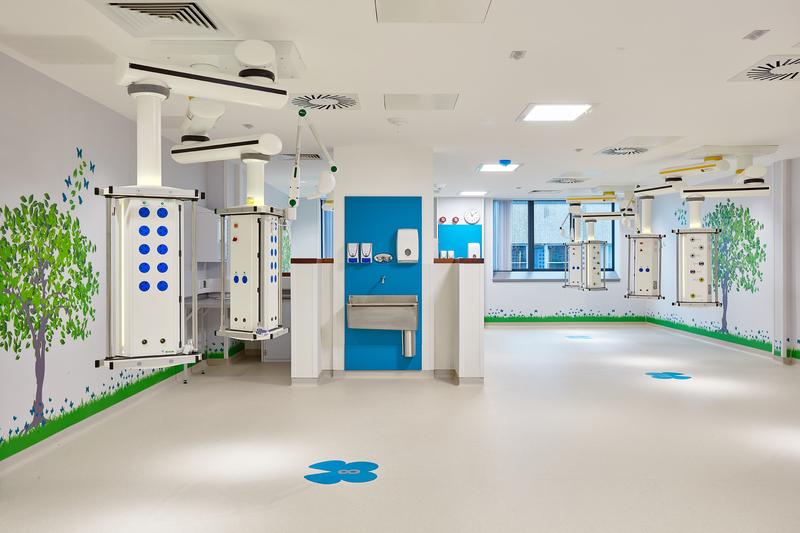 When it comes to refurbishing or designing a healthcare environment, it is recommended that specifiers liaise with a reputable flooring manufacturer in order to maximise the health and wellbeing of the individuals using the space.